"Lipizzaner Mares In Early Foals"
These are some of the Tempel Farms Lipizanner mares grazing in their opulent Wadworth pasture. Tempel Farms is home to the world-famous Austrian Lipizzaner dressage stallions. Lipizzaners are always grey, gradually turing white as they age. 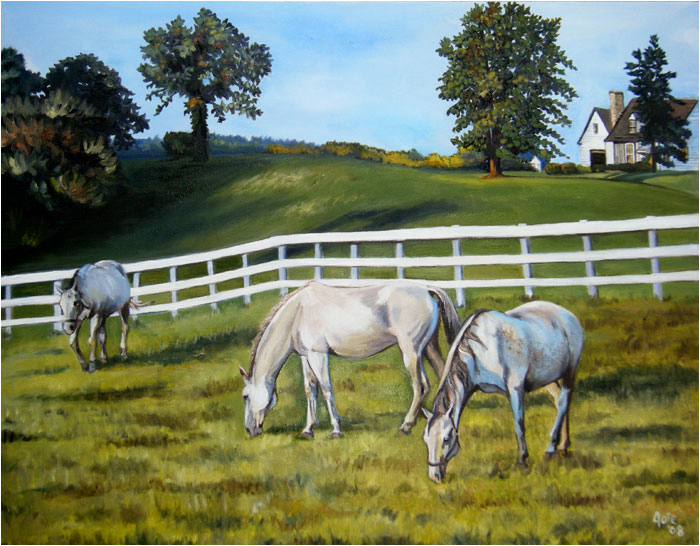 In this painting, I tried to make the same greyish color interesting by focusing on the light source hitting each horse in relation to a white fence. Read more about the Tempel Lipizzans here.